Let's talk about the excuse LDS give for polygamy in Jacob 2:30: "For if I will, saith the Lord of Hosts, raise up seed unto me, I will command my people, otherwise they shall hearken unto these things." The context of this chapter in the Book of Mormon is what an abomination polygamy is. So LDS claim that the only condition that God would allow it is if He wants to raise up seed. If that's the case, then how exactly is polygamy a solution rather than monogamy? When God created Adam and Eve, you would think this would be the optimal time for “raising up seed.” God certainly prioritized them being “fruitful and multiply[ing]” prior to the fall (cf. Gen. 1:28). Yet God commanded this without destroying the “one flesh” arrangement. In other words, He didn’t give Adam multiple wives or Eve multiple husbands to perform their mission. The revelation for polygamy in D&C 132 was in 1843. At that time there were just about 26,000 LDS members. How is an abominable practice of polygamy going to raise up seed rather than telling all the husbands and wives living monogamy to be fruitful and multiply? LDS have often said that polygamy was justified when men were in short supply during the days of traveling across the plains. Yet there are many problems with this. For example, 1) where does this belief come from that there were far more women? It seems to me if anything, there would be more men, since men would be more likely to survive those harsh conditions. 2) There were about 35,000 members in 1847, the year they entered Utah. So how low would the numbers of men have to be here before LDS would allow this abominable practice? Half of 35,000 would be around 17,500. So let's play along with the LDS story and say there were some really low figure of men. Let's hypothesize there were 10,000 men to 25,000 women. Again, how is an abominable practice of polygamy going to raise up seed rather than telling all the husbands and wives living monogamy to be fruitful and multiply? 3) The only justification from Jacob 2:30 is being forgotten here. LDS are changing the subject. The excuse now is the care and protection of all these women who need husbands. Where does this justification come from? Pity? This turns out to be demeaning to women. Women can certainly survive and take care of themselves without having to enter into the abominable practice of polygamy. 4) Taking care of women is one thing, but this certainly doesn’t account for Joseph Smith taking little girls as young as 14 years of age long before the Mormons' trek out west. Their parents could take care of them without having to give them to some 37-year-old creep, who bribes them with the promise of eternal salvation. 5) Taking care of women in need is one thing, but this doesn't account for Joseph Smith marrying other men's wives who were currently married to other living husbands. 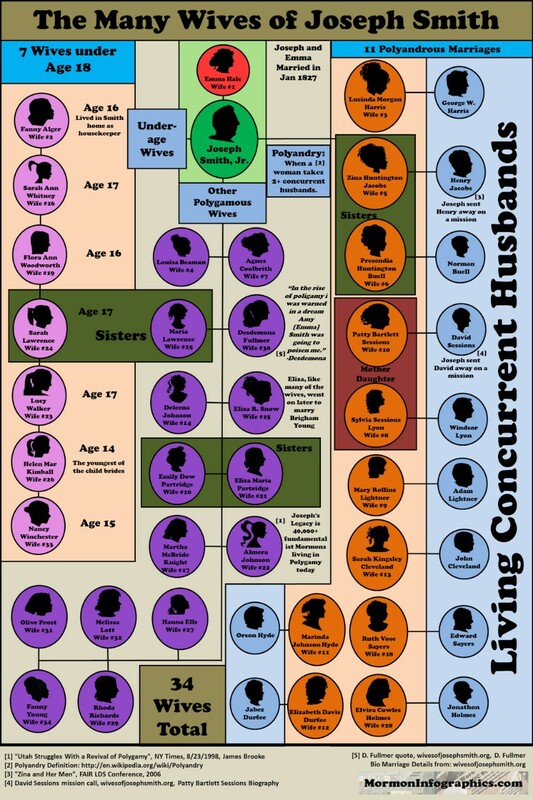 Smith had at least 11 of these polyandrous wives. So using Jacob 2:30 turns out to make no sense in justifying the abominable practice of polygamy. Mormons who use this are simply attempting to pull a CYA[nterior]. Even though God allows polygamy, it has always been destructive of the one flesh arrangement He instituted in the beginning.